BoxCycle - Sell or Give Away Your Used Boxes with Ease! You have used or new boxes you'd love to get rid of. People near you want cheap moving and shipping boxes. You can reduce waste and make money by connecting with them, but finding buyers and dealing with them is more trouble than it's worth. This is where we come in. 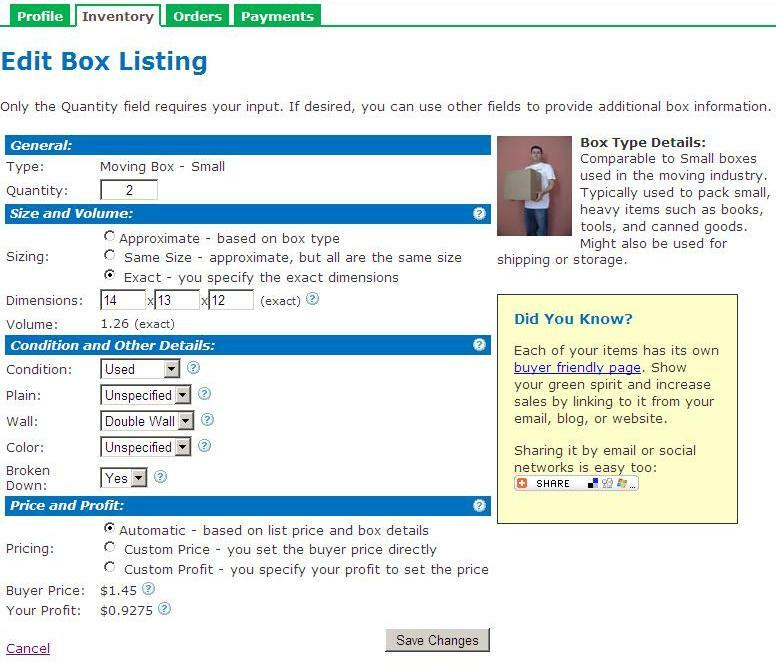 BoxCycle was built specifically to make selling boxes to others simple and profitable. Learn more about our selling process, unique benefits, and target sellers or check out our frequently asked questions. Our unique approach saves you time and frustration, gets you more money, and makes it easy for you to help the environment and your community by selling your used boxes. Zero Risk: Listing boxes isn't binding, takes minutes, and costs nothing. Minimal Time: You are involved minimally and only after there is a confirmed order. Customer Service: We take care of all buyer questions. You only deal with us. Binding Orders and Appointments: Buyers are penalized for cancellations, lateness, and appointment changes making sure your time isn't wasted. Great ROI: BoxCycle reduces work and increases profit allowing most sellers to achieve a substantial return on investment - calculate it now! More Buyers: Our advertising, search positioning, and online marketplace find buyers for you. Appointment Scheduling: No back and forth. Buyers commit to two time ranges within your hours before you are contacted. Privacy: Buyers only get your address after you confirm the order. Your contact information is usually not shared, even with confirmed buyers. Full Control: You decide on minimum order, pickup hours, lead times, and more. Payment Processing: We collect, verify, and process all payments from buyers; you get paid by us. Maximum Profit: By selling to retail buyers you get many times more than scrap value. Best for Environment: BoxCycle is the greenest solution for used boxes. There is nothing better than local reuse. 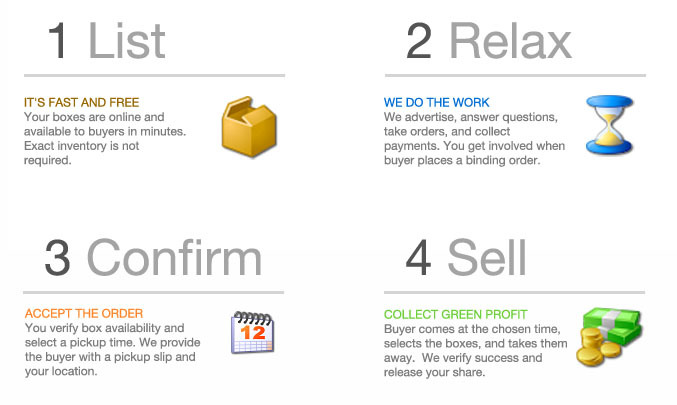 Full Service: We are here to help you manage your listing and make selling boxes work for you. Only the Beginning: We continuously improve to make selling boxes even easier, greener, and more profitable. BoxCycle was built to be simple and flexible. Anyone, from retailers and individuals who never thought about boxes before to large box manufacturers and resellers, can use BoxCycle as a green and profitable sales channel for used and new boxes. Retailers: Turn used boxes from incoming shipments into profit, foot traffic, and good image. Offices: Profitably reduce waste and your environmental impact. Recently Moved: Help the environment and your community while recouping some of your moving cost. Box Resellers: Add a low-hassle sales channel and get more buyers. Moving Companies: Sell used boxes without sacrificing new box sales or increasing liability. Box Manufacturers: Get rid of your overstock, overrun, and misprinted boxes for more. Sell all your boxes directly to the public for higher profit. Find volume buyers in our Boxes Wanted section. Recyclers: Get many times the scrap value for still useable boxes. Warehouses: Profit from used boxes from incoming shipments and get boxes you need for cheap. Environmentalists: Lower your impact through local reuse - the greenest solution for used boxes. Building Managers: Earn extra income helping tenants with their moving box needs. Entrepreneurs: Build a profitable business by collecting boxes from others. Schools and Non-Profits: Try green fundraising with used boxes. How Do I Sell You My Boxes? Can I Just Drop-Off My Boxes Somewhere? What About Getting Them Picked Up? I Already Recycle, Sell, or Give Away My Used Boxes. Will I Have to Stop or Change What I Do? Do I Have To Store Boxes? Can I Gather Boxes After I Get An Order? Can I Sell Boxes Outside of the United States? What Used Boxes Can I Sell? For How Much? Can I Sell New or Like New Boxes? Can I Sell Supplies Like Paper, Peanuts, and Bubble Wrap? Do I Have to Clean or Flatten Boxes Before Listing? Can I Set a Minimum Order? Sell Packs, Kits, or Pallets? Offer Volume Discounts? Can I Ship or Deliver Boxes to Buyers? Can I Provide More Box Details or Custom Pictures? Won't Listing My Boxes Take Too Long? How Much Does It Cost to Sell Used Boxes? Will I Have To Answer Many Questions From Buyers? Will Using BoxCycle Take a Lot of My Time? I'd Love to Help the Environment, But I Do Have a Business to Run! Will I Make Enough? Won't Doing This Be a Cost to My Business? Can I Get More Profit for My Boxes? How Do I Verify the Buyer At Pickup and Reduce Issues? Do I Have to Be At the Appointment? Can I Leave Boxes For the Buyer? I Have an Appointment and No One Showed Up! Appointment Went Fine, Now What? I Am Having Trouble Logging In. Can You Help? Do I Need to Pay Taxes on My Earnings? What Tax Information Do You Report? Do I Need to Collect Sales Tax? Do You Have Any Reports That Can Help Me With Taxes? I Have Another Question or Suggestion! We are based in San Francisco, CA. Boxes can be listed for sale anywhere in the United States. If you'd like to sell outside of the United States check international info. List Boxes for Sale - Boxes will be available for purchase through our Buy Boxes section. Most purchases are local though you can offer delivery to expand reach. When you create a listing everyone with a matching Wanted Listing will be notified automatically. Keep reading this page for all the details and common questions. Sell to This Buyer Listings - You can sell directly to buyers who expressed interest through Wanted Listings if their listing has a 'Sell to This Buyer' button and your boxes match their request. Learn more about Sell to This Buyer Wanted Listings. Check our Boxes Wanted section for listings with a 'Sell to This Buyer' button. Buyer listings will indicate if they accept drop-offs and/or offer pickups. Proceed through checkout to schedule your appointment. If there are no Sell to This Buyer listings in your area you will need to list your boxes for sale, check for new listings in the future, or dispose of your boxes outside of BoxCycle. This is true even if you want to give your boxes away for free or are willing to pay to have them picked up. If you need regular pickups we can notify you when interested buyers become available in your area. Although BoxCycle is safer than many alternatives, you are still selling to independent, unvetted third-parties and should take common-sense safety precautions, similar to what you'd do with online or newspaper classified ads. Have other people with you during the appointment. Verify the buyer prior to letting them in. Consider leaving the boxes outside instead of letting the buyer in. There is no charge to list on BoxCycle and we do not require exclusive access to your boxes. We help you get rid of some of your boxes in a more profitable and environmentally friendly fashion. You can continue to dispose of the remaining boxes as you've always done. If you already have your box information in another system we can even create your listing for you with Express List and take care of regular adjustments to keep it current. All free of charge. Your listing should accurately reflect boxes you can provide to the buyer. You can store boxes until sale, adjust your listing to keep up with inventory changes, or let us make regular adjustments for you - simply contact us with your schedule. You can also specify a Lead Time to allow yourself time to gather boxes. Lead Time is the minimum number of days in advance that the buyer can schedule their pickup appointment. Lead Time is intended for sellers who receive boxes on regular basis and/or are reliably able to gather boxes within a specific period of time. Your listed inventory must be a very conservative estimate of boxes you will have available in time for buyer's appointment. Keep in mind that buyers are more likely to buy from sellers with shortest lead times. Not yet, but we plan on expanding to other countries. Tell us about your interest and we'll notify you when we are available in your country. You can list any boxes that meet our minimum quality standards. You do not have to enter specifics of your boxes or think about pricing. To make listing simple, we maintain a list of box types and set default list prices to fair and competitive levels. You can set additional box properties and custom prices after listing or by using Advanced List. Yes. New, like-new, and excellent condition used boxes automatically earn premium pricing. You can use Advanced List or edit the box condition and fine-tune pricing after creating your listing. Yes, you can list supplies through the Packing Supplies category. For more information see our blog post about selling supplies. You do not need to remove tape or labels or do any other cleaning. Buyers understand that boxes have been used. Simply take care to meet our common sense minimum quality standards. We assume that boxes will be broken down, but allow listing unflattened boxes. You must edit each unflattened box entry to set the 'Broken Down' property to 'No'. The list price for unflattened boxes is 20% less. You can set any minimum order you like in the Preferences section of your Profile as long as it's at least $2. By default, we automatically set the minimum order to the lesser of $10 or the total value of your inventory. If you offer delivery you can also specify delivery discounts, or offer free delivery, at a specific order size. Yes, you can enable Delivery in the Profile tab of your account. You set prices for various distances and can offer delivery discounts for larger orders. Delivery fees are charged a commission of 5%. Sellers who offer delivery extend their reach, appear in more buyer searches, and are highlighted in search results. Shipping by commercial carriers like UPS is in beta testing with a limited number of sellers. If you'd like to participate please let us know. Additional box properties can be added after listing or by using Advanced List. If available properties aren't sufficient, we can add a short note and/or a custom photo for your box, simply contact us with the information after creating your listing. Extra details can be very	helpful for listings targeted at commercial buyers (such as large volume sales or bulk transport boxes) or for boxes that don't quite fit into our box types. Listing boxes should not take you more than a few minutes, including the one-time sign-up process. If it takes you much longer you are probably doing more than is expected of you. You do not need to sort through your inventory before listing. Simply make a conservative guess about sizes and quantities of boxes that you have. Once you have a buyer you will have a chance to make sure that you still have enough boxes to fill their order. If you already have your box information in another system, request Express List and we'll create your listing for you at no charge. There are no upfront costs. We get paid only when your boxes sell. Our commission is 50% of our default list price with a maximum of $1.00 per box and $100 per order plus 5% of any amount for which commission was not already charged. When you increase the price above list you get 95% of the increase (i.e. 5% commission). We handle all communication with buyers. Buyers do not have your address until they make a purchase, commit to a pickup time, and you confirm their pickup appointment. We do not typically share your contact information with buyers even after the appointment is confirmed. We even have options to automatically manage inventory and confirm appointments. Our top priority is to make reuse make sense for sellers. We will continue to remove whatever unnecessary work still remains as we improve BoxCycle. BoxCycle makes it easy for you to help the environment and your community, but it also offers sellers a significant positive ROI (return on investment). Use our ROI calculator below to see for yourself. Please enter the cost of your employee's time, average order size you expect, and average amount of time you believe processing an order will take. Note that your actual returns will almost certainly be higher because (a) the calculator assumes a flat 50% commission (b) you can schedule work and box pickups during slow times when your employees are less busy effectively reducing your cost to nearly zero (c) BoxCycle removes some work that otherwise needs to be done (e.g. carrying out boxes) (d) you may generate additional business from the extra foot traffic and/or your more green image. If you require a still higher ROI you can require a higher minimum order, create higher quality listings, or set custom prices. There is no downside to listing your boxes. Our list prices are suggestions to make selling boxes easer. You can use Advanced List to list with a specific profit or you can set a different sale price or profit after creating your listing. Our commission for any amount beyond list price is only 5% so virtually all of the sale price increase will go to you. BoxCycle will automatically increase the price of more valuable inventory as specified below, but you can always set your own prices. New Box - 25% premium on list price - includes overruns, misprints, etc. Inspected Used Box - 10% premium on list price - manually verified to be in excellent/near-new condition. Plain (New) - 15% premium on list price - no printing, markings, or labels: exactly like brand new. Plain (Inspected) - 5% premium on list price - no printing, any markings/labels must be easy to cover by a single standard shipping label. Same Size - 6% premium on list price - boxes are of the same size. Actual Size - 4% premium on list price - exact box dimensions are specified. Double/Triple Wall - 35%/50% premium on list price. Example: A medium moving box has a list price of $1.00, yielding a $0.50 profit for you. If you list a plain overrun new box and specify an exact size the price will automatically increase to $1.50 ($1.00 + $0.25 + $0.15 + $0.06 + $0.04) and your profit to $0.98. If you require a $1.50 profit instead, you could edit your listing to require this profit; the sale price will be automatically set to $2.05. We collect payment from the buyer when they place the order and credit your share to your account after the order is completed successfully. There are valid reasons for legitimate buyers to not exactly match the order; use your judgment. If you are uncomfortable with letting the buyer in, ask them to come back in a few minutes so that you can leave the boxes outside for them. To minimize post-order disputes, encourage the buyer to inspect their order and have them sign the pickup slip with the final count and/or any adjustments to the original order. You take additional risks by leaving boxes, though most of the time it works out great and saves you and the buyer time. First, about 5 minutes after your appointment time, try to contact the other party using our Anonymous Connect feature. Often they'll just be running slightly late or need some help with directions. If you are unable to get an acceptable resolution or can't reach the other party, please report the issue to us once lateness exceeds 15 minutes. We realize that no-shows are a significant time sink for everyone involved. We make clear to buyers that appointments are binding and have penalties for not showing up. Sellers get half of all penalty fees. Appointment Went Great, Now What? You will be paid after the order is completed, either by the buyer or automatically after 2-3 days. You can expedite the process by logging into your account and completing the order yourself. The buyer will be able to override completion in case of issues, but for a shorter period of time that will be shown in your order status. Order will be considered complete after the override period is over. Please request a password reset. If you continue to have problems please contact us. Click Show All in the Preferences section of the Profile tab in your account. Then click the Close Account link. BoxCycle is a marketplace that enables transactions between buyers and sellers. Sellers are responsible for reporting and paying their taxes. BoxCycle does not withhold taxes from payouts. Please consult a tax specialist for assistance. BoxCycle will provide a 1099 form to you and the IRS if you receive $600 or more in payments during a calendar year. If BoxCycle doesn't already have your W-9 form on file, you will need to submit it once you get close to $600 in payments. You are responsible for abiding by your local sales tax laws. BoxCycle will collect sales tax from the buyer at the rate you specify in the Preferences section of your Profile. The entire amount collected from the buyer is remitted to you. It is your responsibility to properly report and pay taxes, even if you do not collect them from buyers. Once you have at least one payment you'll see a Sales Report form in the Payments tab of your account. With this report you can see your Gross Sales, Payments, Collected Sales Taxes, and BoxCycle Commissions and Fees for any time period. Please consult a tax specialist with your tax questions. Feel free to contact us if you still have questions or just start selling! There is no cost, no risk, and it really just takes a few minutes. Doing it will answer most of your questions. We continuously strive to make BoxCycle simpler and more efficient so that more boxes can get reused. Your ideas help us add and prioritize improvements and are always welcome. Copyright © 2008-2019 intelliHoldings. All rights reserved. The names and logos for BoxCycle are trademarks of intelliHoldings.